Wow … look at all the ‘On-Going’ music events! promise that they will stay in school. … some of the best local music in the city every Monday night… for free. Check the Satellite calendar to see who’s on the bill each month. – Keep Checking in @ Yelp for Glendale and adjoining regions. note: Feburary – April 2015 – call for more info. to stay. 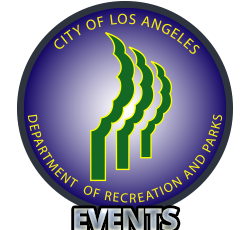 Hosted by the Department of Recreation and Parks. Echo website for VIP entry. Concerts at 8pm; open to the public at no cost. and interact with fine musicians and music in a concert setting. from diverse social and economic backgrounds. diverse styles of music for string instruments. Soul & Blues from Detroit City. We’ve provided links for most and check back often for further updates! with song and dance for the whole family. FREE. Every Sunday at 5 p.m. to 7 p.m.
Bring a picnic, blanket and beach chair, and enjoy a sampling of jazz music. Kids can run and play while parents relax… and everyone can enjoy the end of summer with hot jazz while enjoying the cool ocean breeze. There will be a different food and dessert truck weekly. Check the lineup online to see who is playing this week. Don’t miss these free Sunday concerts on the beach, where you can end the weekend with a picnic and free as you watch the sunset and the kids play by the beach. Check the lineup to see what band is playing each week. Aug 3 at 3:30 p.m.
Bilingual Pop Artist for kids Twinkle, brings you her colorful, high energy pop concert Twinkle Time-fusing education, language, arts and pop culture. Aug 5 at 12:30 p.m. to 2 p.m.
Have a little music with your lunch with the Brazilian sounds of the Brasil Brazil. Wednesday concerts are held at lunchtime during the Pershing Square Farmers Market, so shop for lunch or dinner fixings before relaxing (or dancing) to the music! Aug 6 at 6:30 p.m.
Lythgoe Family Productions is the perfect group to introduce your children to theatrical panto. Princesses, Pirates, and everyone in between will keep your child (and you!) entertained and engaged. Be sure to come early to enjoy the KidZone every Thursday before the show at 5 p.m., featuring kid and family-focused vendors and nonprofit community partners presenting interactive fun and games. On any given night, a kiddo may get their face-painted, grab a balloon, and color to their heart’s content. You’ll be blown away when 400 french horns take to the WaterCourt to play a veritable hornocopia of pop, rock, and classical standards.French Horn Massive is performing at the Grand Performances lunch time series this Friday. 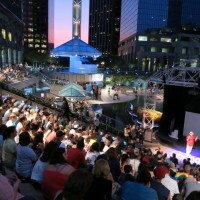 These concerts take place at noon and are free, outside and downtown. Plan a day downtown around it (with a trip to the Central Library, Grand Central Market, Grand Park or a tour of the Disney Concert Hall)! The mission of First Fridays is to promote and support local artists and musicians by providing them with an outlet to showcase their work. Every first Friday night of the month, participating Bixby Knolls businesses will unite to promote local artists and musicians through extended operating hours. In doing so we hope to encourage a dialogue between businesses, artists and the community. Teacher, jamster and respected L.A. musician Lonnie Marshall knows how to throw a nice and nutty party. Just ask his cohorts from Fishbone, Trulio Disgracias and Red Hot Chili Peppers, with whom he’s shared the stage for some memorable bashes, mashes and groove-driven madness over the years. Now the bassist (who teaches at Flea’s Silver Lake Conservatory of Music) has a regular Friday-eve happening, and the whole family can get funky with him. The weekly event at the Hanglider Bar at Rosalind’s Ethiopian Cafe features a live band, open mic and plenty of rug-cutting and booty-bumping. Big-time musical guests have been popping in to get the funk out with Marshall and the gang, too. Dinner is available and we advise reserving a table — you’ll need the energy to keep up with these self-proclaimed “Mega Nutts.” Call (323) 936-2486 for dinner reservations. One of L.A.’s hidden treasures…,” L.A. Times Magazine. PALG has also been featured in many online and print articles as “one of the best things to do in L.A.